Ozone (O3) is found commonly in nature. Ozone is formed whenever lightning occurs, or when an electrical discharge creates a spark. The ozone layer in the upper atmosphere provides a protective screen against dangerous solar radiation. The generation of ozone is a relatively simple process. Air or oxygen is drawn into the ozone generator, at which point the air is charged with high voltage. The air is made up of diatomic oxygen (O2) and nitrogen (N2) . Diatomic oxygen is a molecule composed of two oxygen atoms (O) held together by four equally shared electrons. As the air is drawn through the ozone generator, the high voltage splits some oxygen molecules into oxygen atoms. Some of these atoms then quickly react with oxygen molecules to form ozone: (O1) + (O2) = (O3) . Ozone is a powerful oxidizer and has the ability to neutralize many organic and inorganic compounds. Important Notes: When ozone concentration factors are given by various manufactures the following will reduce your confusion: 1 ug/ml = 1 mg/l = 1 g/m3 = 1 gamma. Also, 1 ml is = to 1 cc. Factors that can influence the outputs are elevation, humidity, pressure, temperature or the purity of oxygen being used. There can also be a variance of outputs between different brands of oxygen regulators and flow meters etc. The Sota Instruments water ozonator is an essential part of the Sota Wellness Kit and is the result of several years research and development. This is a true 200mg. per hour ozonator that is built to last a lifetime. Ozonating your drinking water is a fast and safe means of neutralizing germs, pathogens, chemical residues, pesticides, pharmaceutical residues and more. The Woz-5 is constructed of the highest quality materials and is designed to offer many years of reliable service. It is our most expensive, highest quality water ozonator. ORP (oxidation-reduction potential in millivolts) - unit takes less than 2 minutes to achieve a max. ORP of +1,000 mV in an 8 ounce glass of chilled distilled water. For 32 ounces, full ORP saturation would take less than 10 minutes. A low cost safe portable energy efficient water purification system. This system neutralizes toxic chemicals and disease causing bacteria and virus. Nature Kleen produces Tri-Atomic oxygen when combined with water and releases oxygen to clean and kill bacteria and viruses in the water by oxidation. Nature Kleen is made in USA. 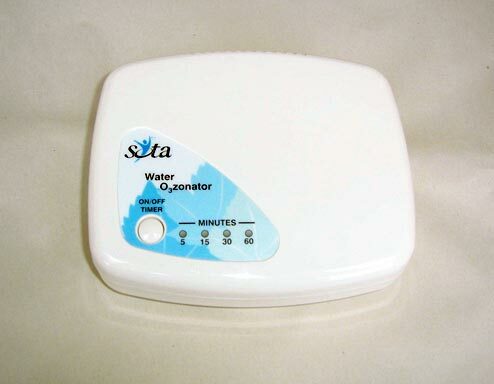 Dimensions: 3" x 5" x 9 1/2"
Disclaimer: the Nature Kleen Water Ozonator is not a medical device. It is not intended for the diagnosis, prevention, treatment, cure or mitigation of any disease in humans or animals. It is not designed to affect the structure or function of any system in the body. If you have a health-related condition that requires medical attention, always consult with a licensed health care professional. Any individual results may vary. We do not offer on-line ordering. Please phone or email your order. Shipping time is normally within 5 to 7 days. Payment by Visa, M.C., Am Ex., Discover, Check, M.O.